After Brunelleschi’s soaring dome, Giotto’s elegant bell tower (Campanile di Giotto) is perhaps the most recognized landmark emerging above the rooftops of Florence. Admire the intricate polychrome marble covering the entire 270-foot (82-meter) height, and climb the more than 400 steps to the top for one of the best views over Florence. Giotto’s bell tower is part of Florence's Duomo di Santa Maria del Fiore complex, which includes the cathedral, baptistery, dome, and crypt. Designed by Giotto in 1334, the Gothic tower is decorated in the same white, green, and pink marble that covers the adjacent Duomo. It’s divided into five distinct tiers decorated with arched windows, sculptural works from statues to bas-reliefs by della Robbia and Pisano, and geometric patterns of different colored stone. Giotto’s bell tower is one of the most popular attractions in Florence, and booking a Duomo Complex tour that includes skip-the-line entrance to the tower, cathedral, and baptistery is essential to avoid long lines to enter. Many Florence sightseeing walking tours and shore excursions also visit highlights like the Uffizi, Accademia Gallery (Galleria dell'Accademia), and Piazzale Michelangelo. Giotto’s bell tower is a must for first-time visitors to Florence. Kids especially love the exhilarating climb and vertiginous view from the top of the tower. There is a single skip-the-line ticket to enter all five parts of the Duomo complex—church, crypt, dome, bell tower, and baptistery—and the Museo dell'Opera. The ticket is good for 72 hours after the first use. There is a lot of ground to cover in the Duomo complex, so be sure to wear comfortable shoes if taking a guided tour. If you are also planning on visiting the church, choose clothing that covers your shoulders and legs. There is no elevator to the top of the bell tower, so the climb is not recommended for those with heart problems, vertigo, or limited mobility. Giotto’s bell tower is in the Piazza del Duomo, just a 5-minute walk from the Santa Maria Novella train station in the historic center of Florence. The Duomo complex in Tuscany’s capital city of Florence is one of the most visited attractions in Italy and can be very crowded during the summer months. The best time to tour the bell tower and complex is from November to March, when the city sights are less overrun with tourists. 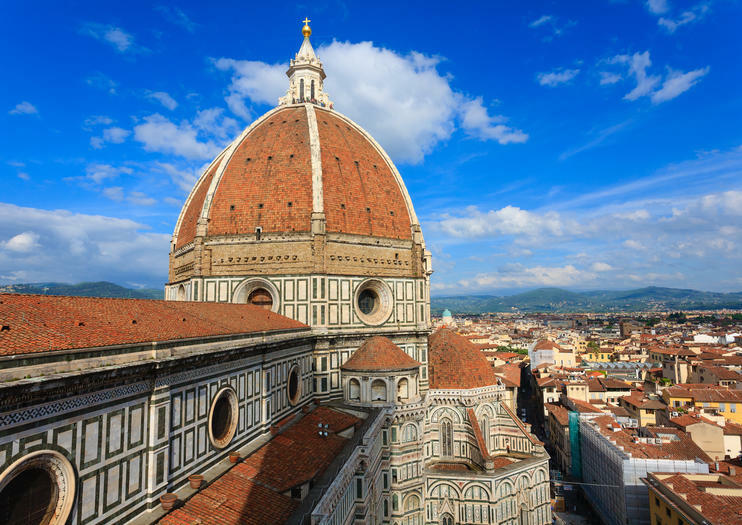 Florence’s Duomo complex offers two sweeping views over Florence: one from the top of Giotto’s bell tower and the second from Brunelleschi’s dome, which sits atop the Duomo itself. An important feat of engineering and architecture, the dome was completed in 1436 and is one of the most recognized symbols of the city today.